With the sale of Mic to Bustle Media Group for 5 percent of its previous valuation in late November and BuzzFeed Inc.’s and Verizon Media Group’s layoffs last week, the digital media industry is being forced to reinvent itself again as it becomes clear that its once-promising “pivot to video” and native advertising-driven business model has stark shortcomings. 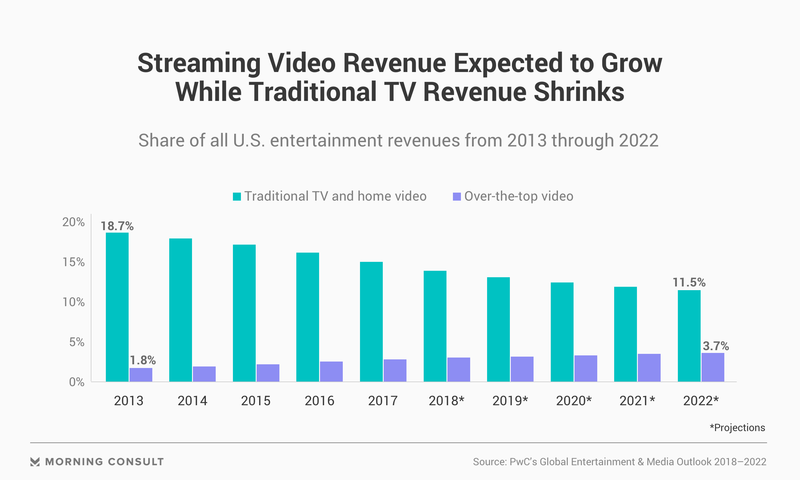 In one pivot from “pivot to video,” digital publishers are looking to create shows for TV instead of their websites as Netflix Inc. and other streaming companies are boosting their budgets for content spending. “It’s definitely a seller’s market,” said Daniel Hong, a partner at Bain & Co. who specializes in media and entertainment and digital practices. He said there is more money in television compared to digital publishing, motivating creators to hop into the space and think creatively about how to monetize their core asset: editorial talent. Vox Entertainment has produced eight shows since its 2015 debut, with more in development, a spokesperson said. It also has a busy 2019 in store: Its four-part documentary series, “American Style,” premiered on CNN Jan. 13; it’s debuting a new as-yet-unnamed infotainment series on YouTube; and it’s preparing for the second season of its Netflix show “Explained,” which was renewed in November. The digital media company, which currently has six-full time production and development executives and more than 100 staffers in its entertainment division, also secured production deals with the Public Broadcasting Service and Facebook Inc.’s video platform Watch. Each of these partnerships has come to fruition in the past year amid three years of effort by Vox Entertainment to build up the division and its content. Mumm said his team is developing and pitching triple the number of projects compared to last spring, though he declined to provide exact numbers. A spokesperson declined to disclose how the entertainment division’s budget stacks up to other Vox units. Vox Entertainment also declined to provide specific revenue and profit numbers; however, a Wall Street Journal report in September said the company as a whole was on pace to miss its 2018 revenue goals by 15 percent. Vox Media declined to comment on the report. Most of Vox’s entertainment deals take advantage of the growing over-the-top video market, which is projected to increase its revenues 35 percent from $22.6 billion in 2018 to $30.6 billion in 2022, according to PwC’s Global Entertainment and Media outlook released in June last year. Deals with digital publishers tend to come with cheaper price tags and shorter contract terms, Hong noted, thus mitigating some of the risk that comes with an established television studio or producer working with greener digital news groups. Hong said the number of television episodes digital publishers produce could be a way to determine whether they’ve become a “sustained success story” or not, though he doesn’t have a specific number in mind. And while the door is wide open for legacy media brands to dip their toes into television, Hong said, it’s going to be easier for digital publishers with more flexible budgets to hop on the bandwagon first. Digital-first company Vice Media, for instance, took the more established route via partnerships with traditional television outlets. Vice broke into its current television and production strategy in 2013 with the debut of its weekly news show on HBO. Its Walt Disney Co. cable channel, Viceland, was announced in December 2015 after Disney’s $400 million investment in the publisher. Vice has also landed partnerships with ESPN Inc. and Hulu LLC and added a daily newcast to its HBO franchise. In an interview with Vice Media CEO Nancy Dubuc at The New York Times’ DealBook conference in November, DealBook founder Andrew Ross Sorkin brought up Viceland’s “challenged” ratings, to which Dubuc said that the channel is still in its infancy and that she expects it to grow. Earlier this month, Viceland revamped its prime-time offerings to include a two-hour nightly live show. Dubuc said in the same interview that the company will be profitable within the next fiscal year, noting that Vice was profitable before a recent period of rapid expansion and investments in various projects, but she did not disclose which projects sank the company’s margins. One challenge Dubuc cited is that cable providers tier Viceland to the most expensive packages, with the hopes of “baiting” younger viewers into purchasing subscriptions, she said. “Our distribution is probably lower than we would like to see” as a result, she said. At Axios Media Inc., the venture-backed Virginia-based news media startup founded in 2016 by Politico alumni Jim VandeHei, Mike Allen and Roy Schwartz, its cross-platform strategy followed a different playbook. Axios debuted a four-part series of specials in November, featuring high-profile interviews with President Donald Trump, Elon Musk, Franklin Graham and Bill Gates. But instead of producing everything in-house, HBO and Axios enlisted an outside director and producer: Emmy winner Matthew O’Neill. Megan Swiatkowski, an Axios spokeswoman, said the show came about during various conversations at HBO, and the Axios team viewed it as a good opportunity for the 2-year-old company to get its name out there. Unlike Vox, which creates all of its shows in-house to be purchased by networks or streaming outlets, Axios for the most part only oversaw content creation for its documentary series, providing the journalists and on-air interviews. An HBO spokesperson did not provide ratings for the series, saying the company doesn’t typically release such information.